We LOVE pizza at our house but I feel bad when we order it because it’s just not that good for us. Plus you don’t really know what’s in it. I’ve never made homemade pizza dough because I thought it would be too hard but thankfully I was wrong! Combine yeast and warm water in a large bowl. Let sit for about 5 minutes until yeast has disolved. In a small bowl mix all the dry ingredients together. Add to water/yeast mixture & combine. Add additional flour if the mixture is too wet. Turn mixture out onto a lightly floured surface and knead for 10 minutes (set a timer because it will feel like 10 minutes but it won’t be!). 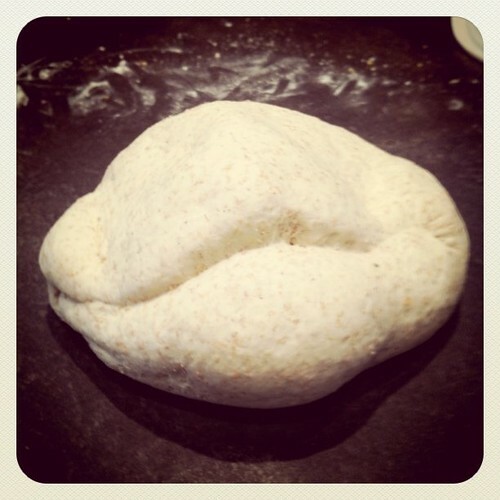 Place kneaded dough into a large bowl that has been sprayed with cooking spray or olive oil. Turn dough ball once to coat. Cover bowl with saran wrap and put in a warm place until doubled (around 90 minutes). Once the dough has doubled, punch it down. You can then use the dough for one thick crust pizza or two thin crust pizzas. You can also freeze half the dough to use later. Let the dough rest for 10-15 minutes (I forgot to do this so it’s not crucial). Grease your pizza pan/stone and sprinkle it with cornmeal. Preheat your oven to 450°F. Roll your dough out on the pan. Brush the dough with olive oil and push dimples into the top of the dough to prevent bubbling. Let rest for 10 minutes while you prepare toppings (didn’t do this so n0t crucial but might make for better crust so I included it). Top with your favorite toppings. For us it was pizza sauce, mushrooms, bell pepper, turkey pepperoni & cheese. Bake for 12-15 minutes or until cheese is melty and starting to brown. Recipe Notes: This is an AWESOME recipe and doesn’t take as much work as I thought it would. 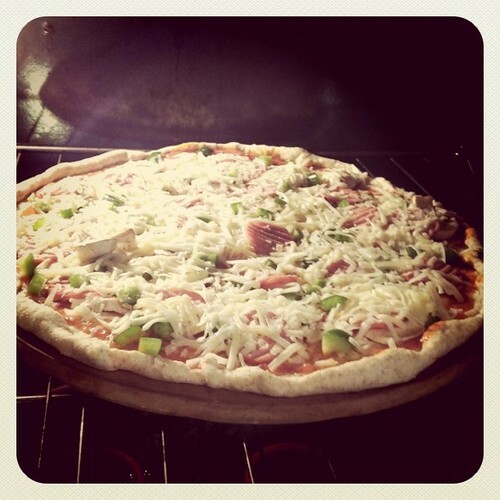 It does take some prep time so I plan to make a few extra batches of pizza dough on the weekend for weeknight pizzas. Thanks for the great recipe!! Pizza dough was on my “to-da” list for things to start making myself. We’ve been trying to eliminate some of the processed foods in our house, when making them from scratch is as easy and much more fun!! It was way easier than I thought it would be. So glad I finally bit the bullet and tried it. We love homemade pizza too. I use my bread maker to mix up the dough. When I have room in my tiny freezer I like to make a bunch and freeze it. I don’t have a bread maker. I always wanted one but in my current kitchen I have no more room! It was pretty easy to make by hand.